The Physio-Control LIFEPAK CR Plus Community AED Package provides communities with everything needed for a first-class and hassle-free AED program. Featuring the LIFEPAK CR Plus and all of the recommended accessories, this particular package is created for environments in which both adults and children are often present. 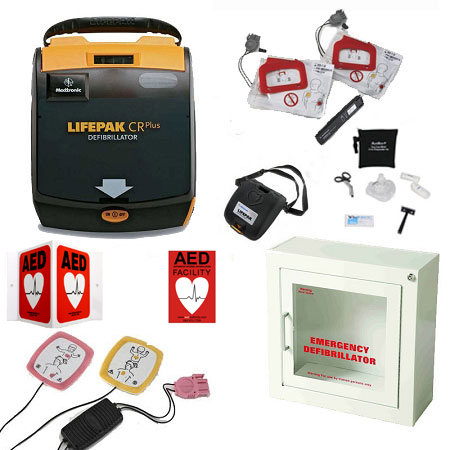 Perfect for settings such as recreational facilities, meeting halls, government and community buildings, airports and more, the LIFEPAK CR Plus Community AED Package ensures you and your team are ready to respond to situations of sudden cardiac arrest for both adults and children alike. Not yet familiar with the LIFEPAK CR Plus (our personal favorite here at AEDs Today)? Then be sure to read our comprehensive review here, or feel free to call us – we're always here to help you and your honorable efforts!